As a master craftsman who likes to keep his home in good order, the garage is your fortress. It’s the space where you go to perfect your craft and create new refurbishment projects to polish and improve your home consistently. But, to make the most out of your garage, you need to keep it clean and well-organized at all times. Instead of whipping out a broom and scoop, you should invest in a good quality vacuum cleaner that you can mount on your wall so that it’s easy to access and use whenever you need to. The great thing about a wall-mounted garage vacuum is that it won’t take up a lot of space and it gives you the best of both worlds. It comes with the best properties of a wet/dry heavy-duty vacuum and a cordless vacuum. Plus, it’s easy to use, quick and efficient. You can use it to keep not only your garage but your car clean as well, which means you can go wild with wooden projects, welding and everything in between without worrying about making a mess. However, finding a quality wall mount vacuum isn’t quite as simple as it once was because there are a lot of different options to choose from nowadays. The key is to look for a vacuum that is powerful enough to pick up all types of dirt and debris, with a sizeable bag or tank to handle a large amount of waste, as well as an excellent filtration system. To help you along, we did some research into the best garage vacuum systems available on the market. To come up with this list, we looked at qualities like technical specifications, quality construction, as well as customer preferences based on garage vacuum system reviews. We’ll also provide you with a buyer’s guide with all the qualities and considerations you need to make in order to find the best wall mount vacuum system for your needs. With 7 gallons of space and a HEPA style bag with 5 layers, this VacuMaid vacuum system is a versatile, effective and convenient model. It comes with a caddy bag, a 30 ft. hose and hanger, dusting brush, a telescopic wand and extra tools for getting in between the crevices in your garage. For example, there’s a dedicated crevice tool that’s ideal for sucking up dirt in-between the seat and on those pesky corners between walls. There’s also a brush that’s designed to eliminate dirt on surfaces like the dashboard, chair upholstery and from carpets. When you think about it, this vacuum system is a real money-saver because you don’t have to buy any additional accessories like you would with other brands and models. This vacuum system is easy to clean and it’s so durable that its lifespan is 25% longer than its competitors. It’s very well-made from powder-coated steel to prevent corrosion over time and you’ll be glad to know that its setup is quick and simple. The HEPA filter is an important part of this vacuum system’s performance because it can pick up even the tiniest bits of dust to filter the air in your garage. This is great news for anyone that suffers from allergies because you’ll be breathing clean air thanks to this vacuum system. When the bag is full, all you have to do is remove it from the tank and dispose of the content appropriately. No need for additional cleanup of the canister. The only downside is that you’ll have to purchase new filter bags every now and then, but this is a small price to pay when you consider all the benefits that this vacuum comes with. To top it off, VacuMaid has created an entire kit to go with this vacuum system. The VacuMaid Wet Pick-Up Kit comes with suitable attachments that allow you to transform your regular vacuum system into a Wet Pick Up. This means you can now use your vacuum to clean up wet messes from all types of surfaces. This kit is made from corrosion-resistant galvannealed steel and has a capacity of 4 gallons. It’s lightweight and easy to use. Say goodbye to cleaning blues when you’re in the garage with the Bissell Garage Pro 18P03 model. It’s thoughtfully designed to change the way you think and do garage cleanup. It has a feature that alerts you whenever the tank reaches full capacity by flashing LED lights, plus the tank is semi-translucent so it’s pretty easy to tell when it’s about to fill up. This is a small and compact unit that you can easily mount on your own and it’ll leave you with enough space to buy new tools. 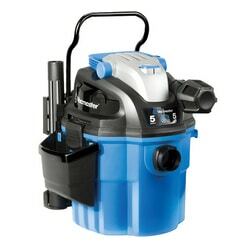 The vacuum is powered by a 12-amp motor, its dirt tank is 4 gallons large and it offers both wet and dry picking capabilities. This means you won’t have to buy a separate attachment or kit to pick up wet dirt. Pro 18P03 functions as a blower as well to make sure your space is always free of dirt and debris. It’s worth noting that Bissell has added seven all-purpose attachments to this versatile cleaning system, including a 32 ft. long hose, a 2-stage filtration trap (which is very efficient) and a dedicated storage bag to keep everything neatly organized. You’ll be glad to know that this vac is backed by a two-year limited warranty as well. If you’re looking for a heavy-duty, professional grade vacuum system, your search is over! 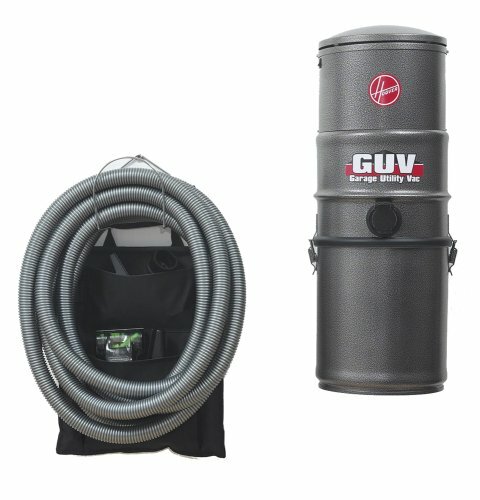 Hoover’s GUV ProGrade model is one of the best garage vacuum systems around. It’s constructed from durable and long-lasting steel that’s super easy to clean, because who has time to clean a vacuum? Not only that but this vac is rust and corrosion resistant so it works in humid environments too. This is one of Hoover’s bagless designs and it comes with a 5-gallon tank that’s large enough to handle the demands of a medium sized garage. Other notable features on this vac include its 10-amp motor which gives the system enough power to slurp screws and nails in a jiffy. It also comes with a 30-ft. crush-proof hose to reach those difficult spots, as well as some handy crevice tools for the different nooks and crannies in your car. All told, this is a solid vac system from Hoover, one of the pioneering brands in the vacuum manufacturing industry. It’s easy to mount, comes with a storage pouch to keep all the included accessories, and it’s backed by a 3-year limited warranty. 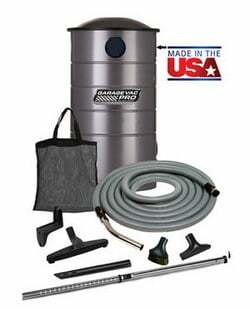 This 5-gallon vac system from Vacmaster is ideal for anyone that wants to save space and cash. It’s made from tough-wearing and ultra-durable plastic and comes with a built-in polypropylene tank. This vac is suitable for both wet and dry applications, while the big motor makes for impressive suction power. The two-stage motor runs like a mean machine despite its whisper quiet noise level of just 75dB. There’s a 21-ft. flexible hose to extend your reach and improve your ability to pick up small pieces of debris and dust. Other features on this vac include a HEPA filter which cleans the air while trapping tiny dust molecules, a foam sleeve dedicated to cleaning up wet debris, a blower function, and a large handle that makes it easy to carry it around while you’re cleaning. The best part about this vac is that it comes with remote control access so you can switch it on and off from afar, and it’s backed by a two-year limited warranty. If you’re really working with a small space, then this wall mounted garage vacuum from GarageVac is the way to go. 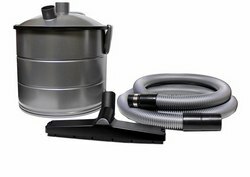 This vac is so tiny and compact that it comes with a 1-gallon canister that uses refillable bags for the waste. Although small and highly portable, this vac comes with a 40-ft. stretch hose that really expands your cleaning capabilities, and once you’re done you can compress it back to its 8-ft. folded size to save space. This is a nicely shaped vac that can fit into awkward spaces and it’s perfect for getting in between the seats and under the dashboard when cleaning your car. The only problem with this vac is that it fills up fairly quickly, which means you’ll need to empty and throw out the canister bags, which can get annoying. Plus, you’ll have to buy 1-gallon bags regularly as you use the vac more frequently. On the bright side, this vac is backed by a six-year warranty, which shows that the manufacturer is really proud and confident about its quality and performance. When looking for the best garage wall mounted vacuum for your space, it’s important that you start by considering the type of work you do. Are you into welding? Do you like working with tiles? Are you more of a woodworker? You need to purchase a vacuum that can handle the type of debris that you produce in your garage. Luckily, there are models that specialize in dry or wet messes and others which can do both. Just keep in mind that you may have to pay a little extra for a vacuum that fulfills both functions. The rule of thumb here is that the more powerful your motor is, the more powerful your vacuum will be. But, powerful vacuum cleaners are often more expensive than other models because they offer better suction and make short work of “difficult” messes like sawdust and liquid spills. Of course, it’s not necessary to buy a powerful vac if all you need it for are easy cleanup tasks. Just be sure to stick to your budget while considering your needs on this one. Most people opt for a long hose because it allows you to reach areas that would otherwise be difficult to access. A longer hose also makes it easy to clean around the garage without constantly carrying the vacuum with you. This means you can just place the vacuum in the middle of the space and extend the hose to reach the areas where you want to clean. For the best results, we recommend opting for a model with a 30 ft. hose or longer. Crush-proof hoses are a must because they won’t lose momentum no matter how many times you accidentally step on them with your working shoes. Chances are that you probably cough up a storm every time you have to work with wood and sawdust. Well, it doesn’t have to be that way if you have a good quality garage vacuum system with proper filtration. For the best results, look for models that come with HEPA-rated filters, which means that it’ll be able to capture dust and debris that fly into the air. This also means you can breathe a little easier knowing that the air is free from sneeze-worthy allergens and dust particles. While you’re at it, make sure the filter comes in the form of a removable bag that you can detach and clean for re-use. There’s nothing more wasteful and time-consuming than having to replace the filters in your garage vacuum system. 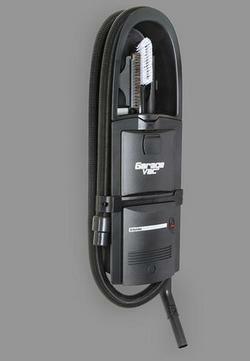 Without the right attachments, a garage wall vac can be cumbersome. To avoid buying additional attachments, rather purchase a vac that comes with its own set of attachments. The most important one is the crevice tool, of course, which allows you to get into the nooks and crannies of your car and your garage when cleaning. You should also look out for vacs that have carpet cleaning and upholstery tools for your car seats and mats. With the right set and number of attachments, you may end up using your vac in the garage, in the house, and on your car. It’s also important to look into the holding capacity of your garage wall vac. You want a unit that can handle cleaning your entire garage and maybe even your car without emptying it after every few minutes. Four to five-gallon models are best for medium to large sized spaces and will make light work of a busy garage. But a model with that much capacity will take up too much space in a small garage. In such cases, it’s best to stick with a 1 or 2-gallon model that’s small enough to fit in your space while handling the amount of debris you produce. There are plenty of fantastic new features that you can find in the latest wall mounted vacuum. From remote control access to multiple functions that take care of wet and dry cleanup tasks and even blower modes. The great thing about these wall mounted vacuum cleaners is that they’re all-in-one units that can take care of all types of messes without the need for buying another vac. This means they offer great value for money and will save you a ton of space as well. Just remember to check if the unit comes with a storage bag for all the extra tools and attachments it comes with. Every time a brand is willing to back their product with a warranty, you know they’re proud of their work. Wall mounted vacuum systems are a lifetime investment which means you shouldn’t have to replace them. So, it only makes sense that they should come with some sort of warranty in case of factory defaults that might occur. For the best results, look for a wall mounted vacuum cleaner that comes with a 3 to 5-year warranty. The main benefit of buying a good quality wall mounted vacuum cleaner is that you can use it for more than just cleaning up your garage. It should be versatile enough to use in cleaning your car interior and your home if you want to. It should also stand up to any and all tests. This means cleaning up sawdust, screws, wet messes – you name it! Of course, the type of wall mount vacuum system you end up with will depend on your needs and preferences, as well as the size of your space. Perhaps you’re prone to allergies and need a vacuum that can handle tiny dust particles and filter the air for you. Or maybe you work on projects that create regular wet messes. In that case, you’ll need a vacuum with a relevant attachment. The great thing about modern wall mounted vacuum cleaners is that they often come with great features like a long hose to easily clean difficult to reach spots. They’re also very powerful and provide superb suction power and have a compact design that won’t take up too much space in your garage. 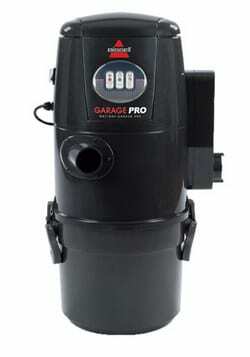 Also, a garage central vacuum is a great idea for anyone that likes to do DIY projects at home. How long is the vacuum cord? Most experts recommend buying a garage central vacuum that comes with a short cord and a long hose. Why? Because you want a hose that can help you reach different sections of your garage, and the most important things with the cord is that it should make it easy to mount the vac. Should I go for a vacuum system with wheels? It’s not exactly necessary for a garage central vacuum to feature wheels. If it was, then you’d just purchase a regular vac, right? Well, it’s not as cut and dried as all that. Some users may want a vac with wheels so they have the option of moving it if they need to reach dirt that’s further than the hose can reach. Also, if you purchase a 5-gallon model, chances are it’s going to be quite heavy and you won’t want to pick it up all the time you’re cleaning hard to reach places. Does the system come with a wall-mounted accessory bag? If you buy a good quality garage central vacuum, then you can expect it to come with a separate case or bag to keep all the extra attachments and accessories. That way, you can move them around all at once whenever you need to clean the inside of your car or your house. Bagged vs. bagless – which is better? A vacuum with a bag is better than a unit without because the bag is essential to the filtration process. It helps to sift out extra dust that might come out of the canister. But bagless models offer more value for money because they don’t require you to constantly change the bags or buy new ones. You simply empty the canister and you’re done. Plus, the dirt is already filtered for you in a bagless vacuum cleaner. Will the vacuum blow too? Your vacuum should offer you the option to blow out the dust if you want to. It’s almost as fun as using your leaf blower in the fall, plus it means you won’t have to empty the canister afterward like you would after using the suction attachment. We should also add that you’ll finish much quicker if you blow out your garage compared to regular vacuuming. Does the vacuum system have a retractable cord? Most people who purchase a wall mount vacuum system do so because it comes with the convenience of sticking to the wall without taking up too much space. But if you want a portable vacuum that you can also mount on the wall, then it’s worth considering a unit that comes with wheels. Perhaps you should also look into buying one with a retractable cord as well, otherwise, you might get annoyed with constantly tripping on the cord. Does it come with a wet pickup feature? Having a wet pickup attachment or accessory is undoubtedly one of the most important aspects of a good quality vacuum cleaner. That’s because it enables you to clean up wet messes without the need for moping or soaking it up with towels. This attachment is a great way to clean bottle spills and winter slush, but it shouldn’t be used to pick up water from a pool cover. As you can see, buying a wall mount vacuum system is a great investment for anyone that needs to take care of messes made in the garage. You can also use it to clean your car or your house, granted that it’s portable enough and has convenient attachments that make the process easier. Hopefully, we’ve now made it easier for you to pick the best wall mount vacuum system for your needs. If you were to ask us to choose for you, we’d definitely recommend the VacuMaid GV50PRO + Wet Pick Up. Why? Because this model has everything you need from a quality vacuum cleaner. From a 7-gallon capacity to a 30 ft. hose and hanger, a dedicated crevice tool, tons of extra attachments for different purposes and a rugged, long-lasting construction, the VacuMaid GV50PRO ticks all the boxes. Sure, it’s a bit expensive. But, can you really put a price on the convenience it brings? We think not. The best part is that this model is easy to use although it’s made from heavy-duty, corrosion-resistant steel. Plus, you can pair it with the specially designed Wet Pickup from VacuMaid for a complete system that you can use for the rest of your life.